Palkova is a traditional Indian sweet which takes more than a hour to make. 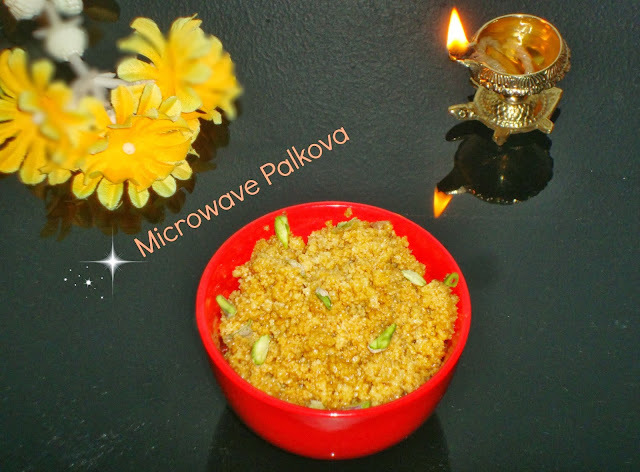 I tried this in microwave oven and it took only 10 minutes; of course, the taste was awesome! Feeling happy!!!! Try out this quick and easy to prepare sweet that is suitable for all special occasions! Take a wide microwave safe bowl and grease it with ghee. Add condensed milk and curd / yoghurt; mix well. Cook in the microwave oven for 10 minutes on high power; take it out to stir in between (every minute). After 5 minutes, you can notice the change in color and consistency. You will see it ready after 8th to 10th minute (Cooking time differs for each oven; mine was ready in 10 minutes). Once it is done; mix chopped pistachios and allow it cool. Your tasty palkova is ready to serve. quick and yummy...lovely pics too.. I would like to experiment this recipe using my microwave oven. Thanks for sharing.